Over the weekend a group of people carried out an attack against a controversial mine in northern Greece causing significant damage to vehicles and mining equipment. On Sunday morning a group of 40-50 people raided the compound of the mining company Hellenic Gold in Skouries, northern Greece, and set fire to some vehicles and equipment. The raid, which caused a substantial amount of damage, was another act in the continuing resistance to the environmentally destructive gold mines in this area. During the early hours the group broke into the compound, restrained the guards and poured flammable material around the area before setting it alight. Around a dozen vehicles and some equipment were destroyed in the subsequent blaze. The group then withdrew, blocking the entrance as they went. Police later detained 33 people but all were released. However a 54 year old local resident has been arrested with police suspecting him of involvement in the raid. ''...we all have an obligation to ensure the possibility of foreign investment in the country. It is known that this is the only way to deal with the huge, dramatic problem of unemployment "
This is not the first act of opposition to the gold mine at Skouries. Clashes are common between police and protesters opposed to the damage the mine will inflict on this area of natural beauty and historical importance. 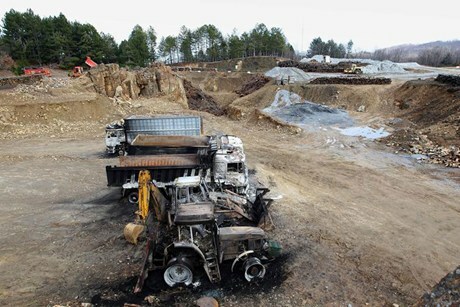 Attacks on mining vehicles and equipment have also occurred in the past. Opposition to the mine has been organised for many months by local residents and widespread support has been shown by demonstrations in Thessaloniki and Athens. According to the most recent post the guards were doused in gasoline and threaten when the group attacked, which is scary. The man arrested has been named as Lazaros Toskas, a member of SYRIZA.The guards have brought a legal case against the Lazaros Toskas who has also brought a case against the guards for slander. According to the most recent post the guards were doused in gasoline and threaten when the group attacked, which is scary. I've heard that the workers doused in gasoline statement is untrue but don't have source.